Dispenses, tightens and seals economical polypropylene strapping around packages or bundles greater than 3". Automatically tensions strap and joins the ends with a secure heat weld. Motor automatically switches off when not in use. As the strap is inserted, the motor automatically restarts. Wall plug standard. 115 V single phase 15 amp. Overall size 22.5 x 35 x 29" FOB Shipping Point. Easy to operate -- simply depress the foot pedal and manually move the mast up and down. 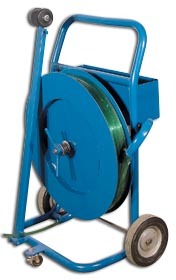 Powered by a 115V, 1/2 HP motor with soft start/stop and variable speed control. Variable R.P.M. 3-12. Units come standard with 1 film rod with special spacers that can be used with any height roll of stretch wrap material between 10" and 20". FOB Shipping Point. 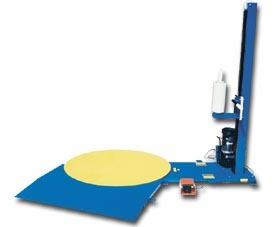 <BR><BR><B>Approach Ramp...</B>allows the operator to load and unload the machine with a pallet truck (HSWA-48 only). <BR><B>Powered Mast...</B>is available with a 24V hand control to work those taller loads. The hand held control is used to raise/lower the film while the foot control is used to operate the turntable. A quick and simple answer to a long time dilemma. 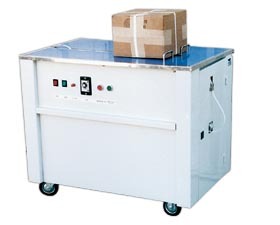 Simply transport unit to your loaded pallet, extend arm and run strapping to end clip. After strapping is secure roll cart into pallet along center stringer, the strapping arm will then protrude out the other end allowing the operator to pull the strapping up and over pallet. 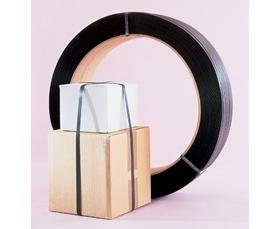 Unit accepts polypropylene strapping. FOB Shipping Point.